Fort Nez Perce (also called "Fort Numipu", the Nez Perce name for themselves meaning "The People") was constructed in 1818 by Donald McKenzie, a fur trader with the Montreal-based North West Company. Fort Nez Perce was located on the left bank of the Columbia River six miles below the mouth of the Snake River and 1/2 mile above the mouth of the Walla Walla River, the location of today's Wallula, Washington. This was the original "Fort Walla Walla", often today referred to as "Old Fort Walla Walla", and is not to be confused with three later military-based Fort Walla Wallas built around the community of Walla Walla. Today, a historical marker made from the actual stones from Old Fort Walla Walla has been erected at a highway turnout on Highway 730 near the site. "... Fort Walla Walla, on the Columbia river, near its junction with the Walla Walla, was originally called Fort Nez Perce. It was established in 1818 by Peter Skeen Ogden, then a North West trader. He was attacked by Indians of the Walla Walla tribe, on the ground where the old fort stands, and obliged to retreat to the island near the fort, where he made a successful defense and completely repulsed the savages. As a trading-post, it was entitled to but little consideration. It was important, however, as a stopping-place for trains, and for keeping the Indians in check. It consisted of an inclosure of pickets some two hundred feet square, with a platform inside, from which the pickets could be overlooked. At the northeast and southwest corners were bastions. The buildings, four in number, were built of logs and mud, one story high, used as residences of employees. Up the Walla Walla river twenty miles were a farm and dairy, where some twenty acres were cultivated. A dam had been erected, but it had disappeared early after the treaty. The country some little distance back was appropriated for grazing, but immediately adjacent to the fort was a complete desert of drifting sand, on which nothing appeared to vegetate except wild sage. 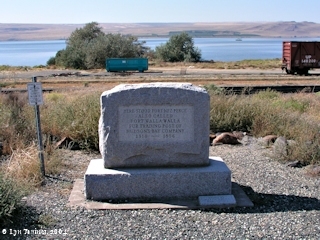 ..."
Click image to enlarge Marker for location of Fort Nez Perce, Wallula, Washington. Image taken September 26, 2004. In 1818 Donald McKenzie of the North West Company established Fort Walla Walla - also known as "Fort Nez Perce" - as a trading post to help control the fur trade from the interior lands of the Pacific Northwest. When the Pacific North West Company merged with the Hudson's Bay Company in 1821, the fort was strengthened and became an increasingly important link in the trade along the Columbia River. 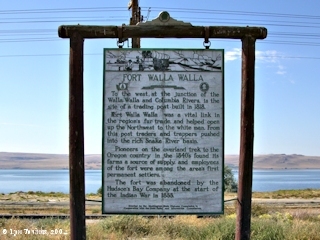 This first "Fort Walla Walla" was located at today's Wallula, Washington (see more information above). 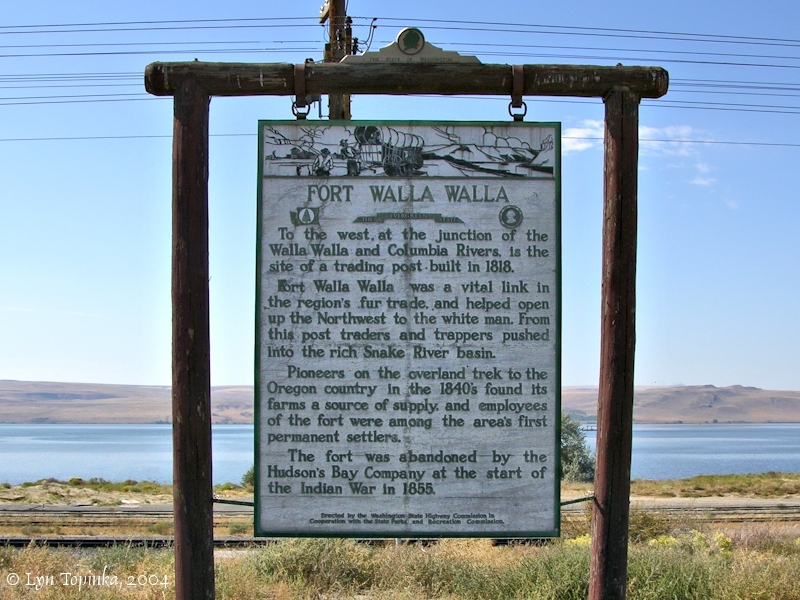 The first military Fort Walla Walla, a temporary fort, was built in 1856 on the south side of Mill Creek, directly west of Kibler and 5 miles northeast of the growing community of Walla Walla. Col. Edward J. Steptoe supervised the building, which consisted of a blockhouse and stockade. The early name for this fort was "Fort Steptoe". It was evenutally named for the Walla Walla Valley in which it was located. The second military Fort Walla Walla was built in October and November, 1856, on the north side of Mill Creek, 6 miles east of the junction of the Walla Walla River with Mill Creek. The compound went from the present Main Street south to the current First Avenue to about Palouse Street. This fort included barracks, stables, officer's quarters and sheds. The third Fort Walla Walla (see The Golden Age of Postcards below) was built the following spring in 1857 on 13th Avenue and Rose Street, adjoining the city of Walla Walla. This fort was more extensive than the previous two forts and covered 613 acres. The original buildings were made of adobe brick, later boarded over and painted white. This fort was extensive and along with the officers quarters and troop barracks included a parade grounds, stables, a blacksmith's shop, granary, storehouse, sheds, and a saw mill. Fifteen of the "fort-era" buildings exist today. A paragraph in the Seattle Gazette, September 2, 1865, mentioned abandoning Fort Walla Walla. "... Fort Walla Walla is to be abandoned by the U.S. troops, the government stores removed to other posts, and its garrison sent into the Indian country. ..."
From the Walla Walla Statesman, Friday evening, January 12, 1866, reflected the bitterness of some of the citizens of Walla Walla. "... The present condition of Fort Walla Walla reflects but little credit upon the Military Department -- or rather upon the individual who lately had the honor to command this immediate district. Governed by no higher motive than predjudice against the people of Walla Walla, the late District commander industriously applied himself to the work of dismantling Fort Walla Walla. Under his orders, all the troops, with the exception of a corporal's guard, scarce sufficient to protect the public property, were ordered away, and the post left to go to ruin. ... Carrying out this policy he has left public property of an aggregate value of hundreds of thousands of dollars, without even amilitary guard, and attended with the dangers incident to a large number of unoccupied buildings. The present commander, Capt. Noble, is doing all that he can for the protection of the property committed to his care; but stripped of soldiers, he is measureably powerless, and for the most part is compelled to trust to luck. FOrt Walla Walla to-day will furnish comfortable quarters for six companies of troops, with stable accommodations for a thousand horses, all which can be subsisted at a much lower cost to the Government than at less favored localities. Dirty Curry knew this, but to gratify his private spleen he has left Fort Walla Walla literally a deserted habitation. ..."
Fort Walla Walla was formally deactivated in 1889 and abandoned in 1911. Today this is the site of the present day Fort Walla Walla park, cemetery and museum complex, as well as the Veterans Hospital and grounds. The first Fort Nez Perce was built in 1818 and was a combined fort and fur-trading post, constructed by Donald McKenzie of the North West Fur Company. In 1821 the British Hudson's Bay Company took over the fort following a merger with the North West Company. "... The timber to build the fort was floated down the Walla Walla River from as much as 100 miles away. The resulting fortress was so formidable that the fort's first factor, fur trader Alexander Ross, called it the Gibraltar of the Columbia. ... Contemporary drawings and letters by early visitors to the vicinity ... indicate that this fort no longer existed by 1831 and that it had been replaced with another less substantial fort made of driftwood from the Columbia. ..."
"... Fort Nez Perces at the mouth of the Walla Walla was representative of these enterprises. In 1835 the post had twelve head of cattle, seventy-five horses, and six pigs: in 1846 the livestock included thirty-six cattle, 115 horses, and thirty-eight pigs. By the early 1840s Pierre Pambrun, the trader, tilled 50 acres olong the Walla Walla River: in 1845 he had twelve acres in vegetables and in 1846 opened another thirty acres some twenty miles from the fort ..."
The Rev. Samuel Parker also mentioned the "self-sufficient" nature of the Fort during his visit in October 1835. "... October 6, 1835: ... FORT Walla Walla is situated on the south side of the Columbia river, ten miles below the confluence of the Columbia and Lewis' river, which last is commonly called, by the people belonging to the Hudson bay Company, Nez Perce river; and one mile above the Walla Walla river, in latitude 46o 2', longitude 119o 30'. Two miles below the fort there is a range of mountains running north and south, which, though not high, yet are of considerable magnitude; and where the Columbia passes through, it is walled up on both sides with basalt, in many places three hundred feet perpendicular height, which renders the scenery picturesque. The soil, for considerable distance around, with the exception of some strips of bottom-land, is sandy, and for the want of summer rains is not productive. This establishment is not only supplies with the necessaries of life, but also with many of the conveniences. They have cows, horses, hogs, fowls, &c. and cultivate corn, potatoes, and a variety of garden vegetables; and might enlarge these and other productions ot a great extent. They also keep on hand dry goods and hardware, not only for their own convenience, but also for Indian trade. Most of the year they ahve a good supply of fish; of which there are abundance of salmon of the first quality. There is a great deficiency in religious privileges. ..."
In 1838 the "Map of the United States Territory of Oregon West of the Rocky Mountains, Exhibiting the various Trading Depots or Forst occupied by the British Hudson Bay Company, connected with the Western and northwestern Fur Trade. Compiled in the Bureau of Topographical Engineers, from the latest authorities, under the direction of Col. J.J. Abert, by Wash: Hood." had the Fort labeled "Ft. Nezperces". Downstream the Wallula Gap area was labeled the "Gt. Bend.". In 1841 the fort was destroyed by fire shortly after the visit by Charles Wilke's U.S. Exploring Expedition. In 1843 Brevet Captain Fremont, detailed with exploring west to the Wilkes survey, wrote about "Fort Nez Perce". "One hundred and eighty miles below Okanogan the Snake, or south branch of the Columbia River, joins the north, and nine miles below the junction is Fort Nez Perces, on the Walla Walla River, built of mud, 120 yards square, and better adapted than any of the other posts to resist a sudden attack." "Fort Nez Perces on the Walla Walla River was formerly the point where the emigration from the United States embarkon the the Columbia, and it is still preferred by large numbers of emigrant families. But a more southern and shorter route has been discovered by which they fall upon the Columbia about 125 miles below the Walla Walla, at an impracticable rapid called the "Dalles," formed by the contraction of the river bed into a narrow "trough" or channel, not more than 30 yards wide, where the boats, etc., are transported overland for a distance of one mile." "... I arrived at Walla-Walla. It is a small fort, built of dobies, or blocks of mud baked in the sun, which is here intensely hot. Fort Walla-Walla is situated at the mouth of the river of the same name, in the most sandy and barren desert that can be conceived, and is about 500 miles from the mouth of the Columbia. Little or no rain ever falls here, although a few miles lower down the river it is seen from hence to pour down in torrents. Owing to its being built at the mouth of a gully, formed by the Columbia River through high mountainous land leading to the Pacific Ocean, it is exposed to furious gales of wind, which rush through the opening in thehills with inconceivable violence, and raise the sand in clouds so dense and continuous as frequently to render travelling impossible. I was kindly received by Mr. McBain, a clerk in the Hudson's Bay Company's service, who, with five men, had charge of the fort. The establishment is kept up solely for trading with the Indians from the interior, as those about the post have few or no peltries to deal in. ... "
The fort was again destroyed by fire in 1855 during Indian uprising and then rebuilt. The fort stayed in operation until 1857, when Fort Walla Walla, located upstream on the Walla Walla River became the commercial center for the area. 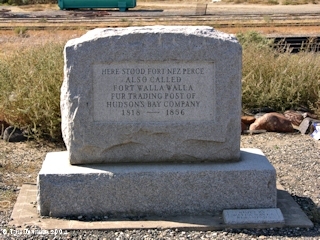 The original town of Wallula was eventually built on the site of the original fort. Penny Postcard: Fort Walla Walla, with troups, ca.1908. Penny Postcard, Postmarked 1908, "Fort Walla Walla, Walla Walla, Wash." Published by Sprouse & Sons, Tacoma, Washington. Made in Germany. Card is postmarked July 16, 1908. In the private collection of Lyn Topinka.